[136 Pages Report] Textile Chemicals Market size was valued USD 25.00 billion in 2017 and is projected to reach USD 31.64 billion by 2023, at a CAGR of 4.0% between 2018 and 2023. In this study, 2017 has been considered as the base year and 2023 as the forecast year to estimate the textile chemicals market size. Different secondary sources, such as company websites, encyclopedia, directories, and databases, such as Hoovers, Bloomberg, Businessweek, Factiva, and OneSource, have been used to identify and collect information useful for this extensive, commercial study of the global textile chemicals market. Primary sources, including experts from related industries, have been interviewed to verify and collect critical information and assess prospects of the market. The top-down approach has been implemented to validate the market size in terms of value. Along with the data triangulation procedures and validation of data through primaries, the exact values of the overall parent market size and individual market sizes have been determined and confirmed in this study. 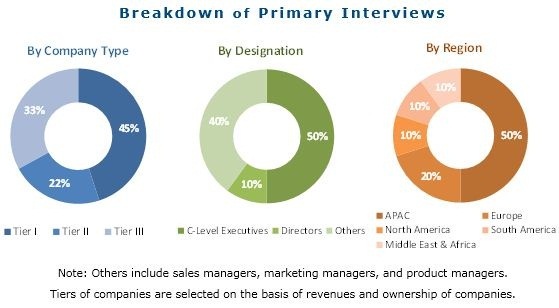 The textile chemicals market has a diversified and established ecosystem of upstream players, such as raw material suppliers, and downstream stakeholders, such as manufacturers, vendors, end users, and government organizations. This study answers several questions for stakeholders, primarily, which market segments they should focus upon during the next 2 to 5 years to prioritize their efforts and investments. These stakeholders include textile chemical manufacturers, such as Archroma (Switzerland), Huntsman (US), Tanatex Chemicals (Netherlands), DowDuPont (US), DyStar Group (Singapore), Wacker Chemie AG (Germany), Evonik Industries (Germany), Rudolf Group (Germany) and Bozzetto Group (Italy. This research report categorizes the global textile chemicals market based on fiber type, product type, application, and region. It forecasts revenue growth and provides an analysis of trends in each of the submarkets. Each type is further described in detail in the report with value forecasts until 2023. Each product type is further described in detail in the report with value forecasts until 2023. Each region is further segmented by key countries, such as China, India, Vietnam, Bangladesh, Indonesia, the US, Mexico, Canada, Germany, the UK, Italy, Spain, France, Belgium, Turkey, Saudi Arabia, the UAE, Egypt, Argentina, and Brazil. urther breakdown of the Rest of APAC textile chemicals market into Taiwan, Singapore, Malaysia, the Philippines, Thailand, and others. Further breakdown of the Rest of Europe textile chemicals market into Poland, the Netherlands, Portugal, and others. 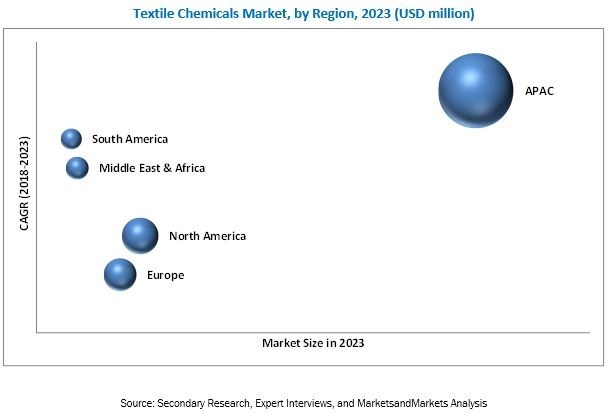 The global textile chemicals market size is estimated at USD 26.00 billion in 2018 and is projected to reach USD 31.64 billion by 2023, at a CAGR of 4.0% between 2018 and 2023. The market is witnessing growth due to the increasing demand for apparel, technical textile, and home textile. Based on fiber type, the textile chemicals market is segmented into natural and synthetic fiber. The synthetic fiber segment is estimated to lead the market in 2018 owing to its low production cost and better performance as compared to natural fiber. The market in this segment is also projected to witness the highest CAGR during the forecast period owing to increasing demand for polyester and viscose. Based on product type, the textile chemicals market is segmented into coating & sizing, colorants & auxiliaries, finishing agent, desizing agents, surfactants, bleaching agents, and others. The coating & sizing agents segment is estimated to be the largest segment in the overall textile chemicals market in 2018 and is expected to maintain this position during the forecast period. This dominance is due to the increasing demand for these agents in the pre-treatment stage of the textile processing chain. These agents are widely consumed as they increase strength and abrasion resistance of yarns. Based on application, the textile chemicals market is segmented into apparel, home textile, technical textile, and others. Apparel is projected to be the largest application segment during the forecast period. Increasing disposable income and growing population has led to a boost in the consumption of apparel, especially sportswear and casualwear. This, in turn, has increased the demand for textile chemicals in the apparel segment. Based on region, APAC is estimated to be the largest market for textile chemicals during the forecast period. Availability of cheap labor, favorable government policies, strong textile manufacturing base, and rapid industrialization are expected to boost the demand for textile chemicals in the region during the forecast period. The growth of the market in APAC can be attributed to the shift of the manufacturing facilities of textile to APAC countries, such as China, India, Bangladesh, Vietnam, and Indonesia. Apart from this, increasing urbanization, large consumer base, and increasing disposable incomes are expected to drive the market in the region. The global textile chemicals market is witnessing moderate growth. Factors restraining and challenging the growth of the textile chemicals market are stringent environmental regulations regarding the disposal of textile effluents and the cyclic nature of the textile industry. Archroma (Switzerland), Huntsman (US), Tanatex Chemicals (Netherlands), DowDuPont (US), and DyStar Group (Singapore) lead the global textile chemicals market. These players are the major manufacturers of textile chemicals and are gaining a strong foothold in the market due to their robust business strategies. 11.11.3 Resil Chemicals Pvt. Ltd.
11.11.11 Zhejiang Longsheng Group Co. Ltd.
11.11.14 The Seydel Companies, Inc.